You may be aware that from November 30 to December 11th, governments all over the world will convene in Paris for a high-profile United Nations conference on climate change. The aim of this conference will be to reach a universal agreement that will enable us to combat change effectively and boost the transition towards resilient, low-carbon societies. The Paris conference will have a profound impact on the lives of every single young person alive today, and on all generations to come. Click on photos to see larger. Pumpkins compliments of Loblaws Elmvale sold at the book sale. World-renowned, most awesome, PPPS end-of-year BBQ!! Silent Cake auction at the June 12 BBQ!! 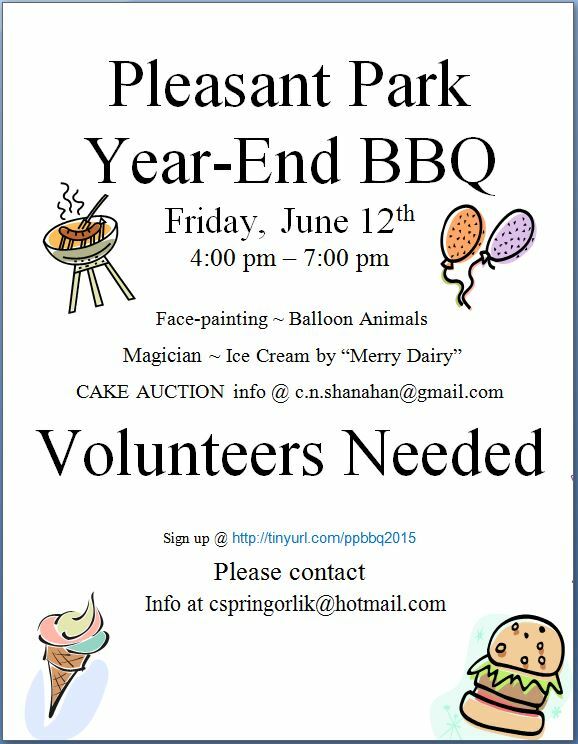 Calling all Pleasant Park Public School bakers! Please donate a cake to our Parent Council Silent Cake Auction… BBQ attendees will bid on your delicious cakes! Last year cakes had fun and creative themes and ingredients. Can’t wait to see the 2015 versions! (Note: please use a plate/base that you don’t mind parting with and please list ingredients on your entry). Place your bid at our silent cake auction at the school BBQ. Bids close at 6:30 pm. Please contact Colleen (c.n.shanahan@gmail.com) for more details. Children’s mental health is a key factor to their success within their family, their school and their peer group. Parents and teachers play an important role in promoting children’s mental health. Understanding how a child thinks and feels can help parents and teachers be their child’s best advocate. Come join us Friday, Feb. 27 from 6:30 to 8:00 in the school gym for an evening of board games. Bring one of your own board games or play one of the many already in the gym. The grade six students will be holding a bake sale to fund raise for the school play, so be sure to bring your change purses!! Thanks to our graphic designer and photographer!